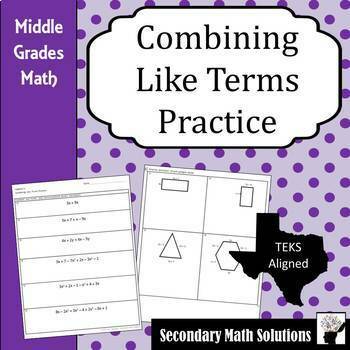 This is a double-sided worksheet providing practice with combining like terms. The front contains 6 combining like terms examples that get more difficult as the student moves down the page. I teach my students to use shapes and/or colors when combining like terms, so the font is larger on these problems. The back contains four application questions where the student is given a polygon with monomial or binomial side lengths and asked to find the perimeter of each. Great for practice of combining like terms with applications. 2 pages. Key included. Need more Combining Like Terms Practice? Check out my Combining Like Terms Coloring Activity!